Timberwolves fans might have been enthusiastic -- and rightfully so -- while watching their squad ease to a 21-point road victory Sunday. Such things have been few and far between, so they need to be celebrated. That said, the opponent must be considered in the equation. 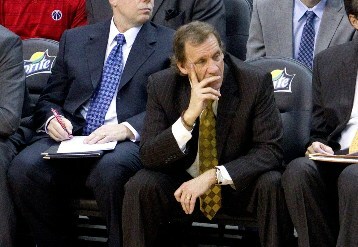 And having watched the game, we have to say the Wizards are one of the worst NBA teams we have seen for a long time. Their 0-8 record doesn't tell the full story. The Wizards, at least on Sunday, played with such a combination of selfishness, lethargy and overall lack of skill that it's alarming. It all stood in stark contrast, of course, to the 13-point, 14-assist night from Ricky Rubio -- chosen with the No. 5 pick in the 2009 draft acquired from the Wizards for Mike Miller and Randy Foye. (Quick aside: A former California-dwelling RandBall reader notes that there is a popular restaurant chain out West called Rubio's, and he is lobbying intensely for Rubio assists to be called "fish tacos." As in, Rubio had 14 fish tacos on Sunday. For some reason, we kind of like it -- so we're putting it out there. We're not asking Hollinger to make it an official stat or anything. Just think of it as something you could try to make catch on). 1) The most stunning thing we learned from yesterday's game: Wizards big-man Andray Blatche was completely unaware until shortly before the game started that Kevin Love is a three-point threat. Per the Washington Post: Saunders blamed the Wizards’ struggles on individual preparation, noting how the coaches e-mail advanced information and provide visual scouting reports for the players. But about an hour before tip-off, Blatche went over the information card the staff gives its players, and was stunned to discover that Love shot better than 42 percent from three-point range. Seriously? That's terrible. Blatche said it was on him, and not Flip or the coaches, but still. Terrible. 2) Flip's job is safe for now, per a blog post today against from the WP: According to one source, Wizards owner Ted Leonsis doesn’t want to change course on the rebuilding plans and incorporate a “plan B” just eight games into the season. Leonsis would like to see progress with the team but has never been known to make emotional or rash decisions, given his history with the NHL’s Capitals. He has also written several times on his blog that the process of building through the draft would be difficult. 3) That said, it might be hard for Saunders to withstand a longer stretch of what we saw Sunday. Considering he has long been the hand-picked choice of many Minnesotans as the eventual coach of the Gophers -- and considering both he and Tubby Smith (in Big Ten play) are winless so far -- it's not out of the realm of possibility that those flames will be fanned by Gopher Nation again soon. The question: If things got to a point where the job was open and Flip was available, would you still want him?